NBA – The cast for the 2018 – 2019 NBA Playoffs is almost completed with only one remaining spot in the Eastern Conference, where three teams battles for the last and the remaining spot on the right to advance in the 2019 post season. The Detroit Piston is currently holding the 8th spot in the East with 39 wins and 41 losses and in a 4 – game losing skid. The Charlotte Hornets tied with the Miami Heat at 10th and 11th places respectively with 38 wins and 42 losses, the Hornets are in 3 – game winning streak while the Heat ate in 4 – game losing skid. Among the three teams, the Detroit Piston has a much better chances of making the post season with lighter assignment in their last two games of the regular season against the Memphis Grizzlies and the New York Knick's. For the Charlotte Hornets they will still have to rely upon on the result of the Piston remaining games, should the Piston losses one of their two last games? Hornets must win both of their last games which has a tougher match in their final game against the Orlando Magic. Meanwhile, The Miami Heat is also in a must win situation, but in a much tougher assignment in their last two games against the Philadelphia 76ers and the Brooklyn Nets. It has been a rough week for the Heat losing 4 – closed games against the Boston Celtics, Minnesota Timberwolves and the Toronto Raptors. So, let’s just wait the result of upcoming games for these three teams and let’s see who will make the final spot or the 8th seed in the Eastern Conference? 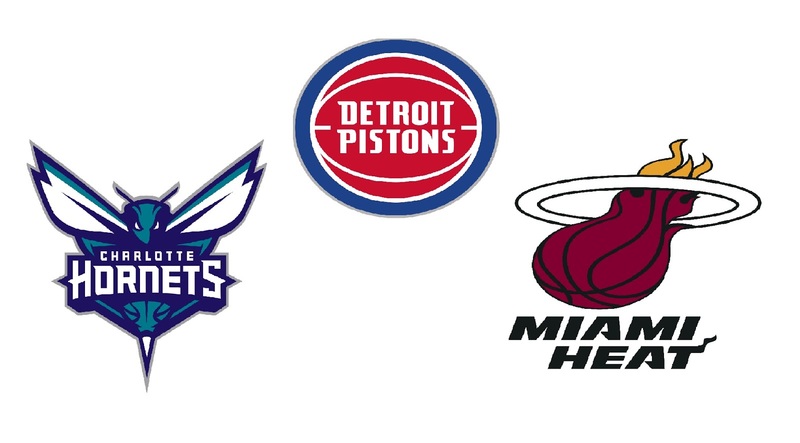 Will it be the Detroit Piston? the Charlotte Hornets or for the final time in the post season Dwyane Wade and the Miami Heat? No Comment to " Piston, Hornets and the Heat Battles for the 8th Spot in the East "